Welcome to InterNations! We are inviting you to join a special evening of socializing dedicated to new InterNations members on Tuesday, 26 February at 19:30 at the coolest pub in town: Victors in Hilton Grand Hotel! 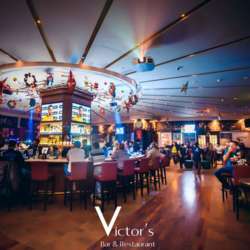 Victors Pub is the place where you can expect smiles, warmth, good food and good times! The evening starts at 19:30 and the welcome drink will be served until 20:30. Please arrive on time!